And the winner of the Circle City Classic Battle of the Bands is Bethune-Cookman University. The Marching Wildcats, along with fans who stayed behind to watch the band battle the Howard University’s Showtime Marching Band, erupted in cheers. Moments earlier, the Bethune-Cookman Wildcats football team had lost 41-35 to the Howard Bison during the 35th Annual Circle City Classic in Indianapolis — a contest that drew thousands to Lucas Oil Stadium on Saturday. Bethune-Cookman’s football team may have left the field disappointed, but the band continued to carry energy into the 5th Quarter, where both bands went back and forth with musical numbers as lingering fans danced along and recorded the battle with their phones. It was the same energy the Marching Wildcats maintained during halftime and, before that, the Circle City Classic parade at 10 that morning. It was also the same vibrant energy the band displayed at the pep rally in Indianapolis’ Monument Circle the evening before. That performance came 30 minutes after the seven busloads carrying the band made it into town after a 22-hour trip from Daytona Beach, Florida, where Bethune-Cookman is located, to Indiana. I know because I was there to witness it all. Growing up in the South, historically black college and university (HBCU) band culture was part of life. If you weren’t in someone’s college band yourself, chances are you knew someone who was. Black college football was special because of it. It is still special because of it. Bathroom breaks, food and beer runs are timed meticulously during games in order for you to be back in your seat for the halftime experience. I’ve experienced the finished product for many bands — the halftime shows, the Super Bowl performances, the parades — but I’d never been able to experience what it takes to make the magic come to life. So when Bethune-Cookman band director Donovan Wells extended the invitation to take the 24-hour ride with the band and experience what it takes to make the 310-member Marching Wildcats so special, I was ecstatic. But I also had no clue what I was in for. Traveling from Connecticut, where the weather was much cooler, I arrived in Daytona Beach a little after 1:30 p.m. on Thursday, and the Florida heat and humidity had already caused beads of sweat to gather above my brow within 10 minutes of my arrival. The plan was to get to campus and wander around until I found my own way to the music building, but I didn’t have to. As soon as I stepped out of my cab, music greeted me. I knew exactly where to go. Four days spent with the Marching Wildcats for a behind-the-scenes glimpse at band life. I headed to the field, where an hourlong practice was in its final stages. Band members practiced as if it was the day of the performance — their final practice before boarding the buses later in the day. I spotted Wells and approached him as he extended his arms for a warm, Southern greeting and welcomed me onto campus. Following the band into the music room, I was given another special Marching Wildcats welcome before announcements were made and members were dismissed. Many of the band members were eager to hit the road. For most, the nearly 24-hour ride would be the longest they’ve taken together as a group. 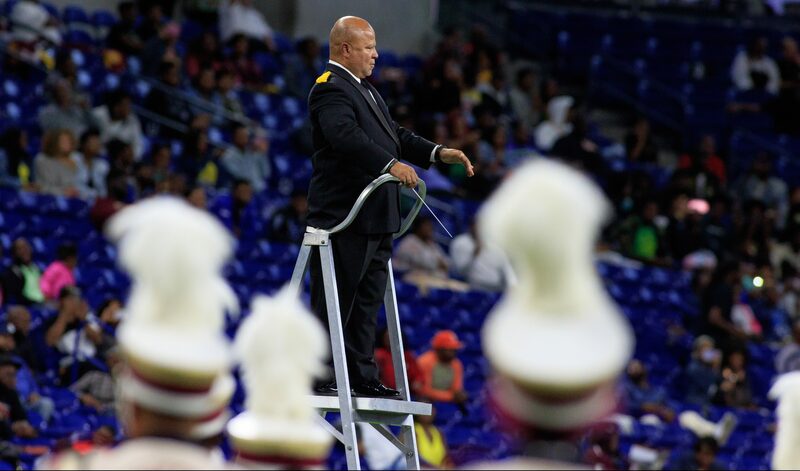 This trip would also mark Bethune-Cookman’s first appearance at the Circle City Classic since 1998 — a year after Wells was named director of bands at the university, and before some of the current band members were even born. Around 5:30 p.m., 30 minutes before departure time, band members gathered again in the music room to go over a few housekeeping rules and a checklist to be sure nothing was left behind, and to pray for safe travels and a successful weekend. To be sure band members are fully equipped with everything, Wells has a system in place. Once all instruments and luggage are squared away, it’s time to board the seven buses by section. French horns and auxiliary board Bus 1, trumpets on Bus 2, clarinets on Bus 3, saxophones on Bus 4, baritones and trombones on Bus 5, baritones and tubas on Bus 6, and percussion instruments on Bus 7. Although modern technology would provide the route, Wells was still sure to visit MapQuest for a physical copy of the directions just in case. The route was straight up through Florida, Georgia, Tennessee and Kentucky before reaching our final destination: Indiana. By 6:30 p.m., buses were rolling. High energy and chatter from my bus, Bus 1, filled the air as movies played in the background. Our first stop would be Jacksonville, Florida, where the more than 300 members would swarm the food court of a local mall. Most shoppers looked on while others walked up to members, inquiring about the massive group. After eating and leaving the food court as tidy as we found it, we all boarded the buses again to prepare ourselves for the longest stint of the trip. It was like being with family. Students began their own singalongs, FaceTimed loved ones, watched classic black movies such as Major Payne and Poetic Justice and comedies Meet the Browns and Norbit, and shared jokes with Wells (who some students call their “father” while on the road) and assistant Villajean Freeman (their “mom”). Band director Donovan Wells conducts the Marching Wildcats during the halftime performance at the Circle City Classic. By 12:30 a.m., a hush had fallen over the bus. Pillows and blankets had been pulled out, and students got as comfortable as they could before falling fast asleep. Wells described this as his favorite part of the trip. A couple of stops were made during the night. By late morning, we’d reached Kentucky and were three hours outside of Indianapolis. We stopped for a quick lunch, then headed for the last stretch of the trip. Although we’d made it in an hour before the band was set to perform at a pep rally, there’d be no time to check into the hotel before the performance. But there were no worries. Band members dressed on the bus, unloaded at the location and jumped into performance mode without missing a beat. The band, dancers and flag team performed in front of a crowd that contained a mixture of Bethune-Cookman fans, tourists and locals who stopped once the band began playing. Two hours later, students unloaded the seven buses and found the 94 rooms they’d occupy during their stay at the JW Marriott in downtown Indianapolis. After traveling nearly 1,000 miles in 22 hours, it was time for rest. Besides, their work wasn’t done. Members would need to be back on the bus at 7:30 a.m. for the Circle City Classic parade before the game’s 3 p.m. kickoff. Drum major Bree’Shawn Watson stands cheerfully on the podium during the 35th Annual Circle City Classic. After a rest in an actual bed, the band members came with a new type of energy, ready to take on the day’s early start. Although skies were gray and cloudy, winds were high and the weather sat at a chilly 53 degrees, the band entertained the large crowd for over a mile before getting back on the bus and heading to the stadium, showing no signs of wearing down. The band members took their seats in the stands, and, shortly after kickoff, began entertaining the crowd early on. They had the upper hand when it came to the matchup. The Marching Wildcats knew what to play in the right moments, whether or not the football team was leading. It was their job to keep the energy and spirits of fans high, and it was a job they took seriously. 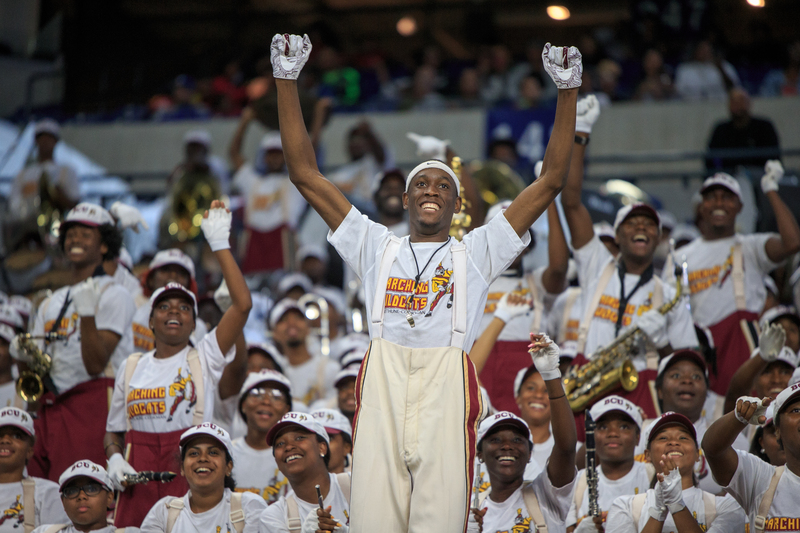 There was a stark difference in appearance between Howard and Bethune-Cookman, but the small yet mighty Showtime Marching Band was determined to shine, regardless of the difference in size. The Marching Wildcats get the crowd hype from the stands. When it came to the halftime show, the Showtime Marching Band took the field first. The band played a mixture of old school and new, from Stevie Wonder to Ciara. And they ended with “Dr. Feelgood” in tribute to the late Aretha Franklin. But now, it was time for the Marching Wildcats to do what they’d traveled 22 hours to do: put on a halftime show that would have the crowd on their feet. The Marching Wildcats perform at halftime during the 35th Annual Circle City Classic in Indianapolis. Bethune-Cookman band at halftime at Lucas Oil Stadium on Sept. 22 in Indianapolis. The band received a standing ovation. Although the football team couldn’t quite close it out, the band carried that energy all the way through to the 5th Quarter before heading back to the buses and loading up to head back to the hotel after yet another successful Classic performance. The bus ride back to the hotel was just as loud as it was the day we first stepped on. Movies were played, songs were sung, jokes were made. The next morning, the band would start the 22-hour trek back to Daytona Beach. As much as I enjoyed my time getting to know everyone, watching black cult classics and sleeping with my head propped on the window of the long charter bus — well, maybe not that part as much as the others — this time, I’d be flying home. To bear witness to the hard work and dedication it takes to make this band one of the best HBCU bands — the best, according to the ESPN/The Undefeated HBCU Band Rankings — was nothing short of amazing. As the Marching Wildcats continue the season giving their all in performances across the country, I’ll always be reminded of what it takes behind the scenes to get to the finished, polished product we see on the field. The Marching Wildcats’ Netflix series, Marching Orders, was only a glimpse into the preparation during band season. On Sunday, the seven buses were once again loaded, ready to travel nearly 1,000 miles back to Daytona Beach. When band members were asked whether they’d do it all over again, the answer was always yes — with smile on their face and a song, preferably one they’d get to perform on the field, in their heart.